Roca’s men didn’t put a foot wrong at the Barabati Stadium, in Cuttack. 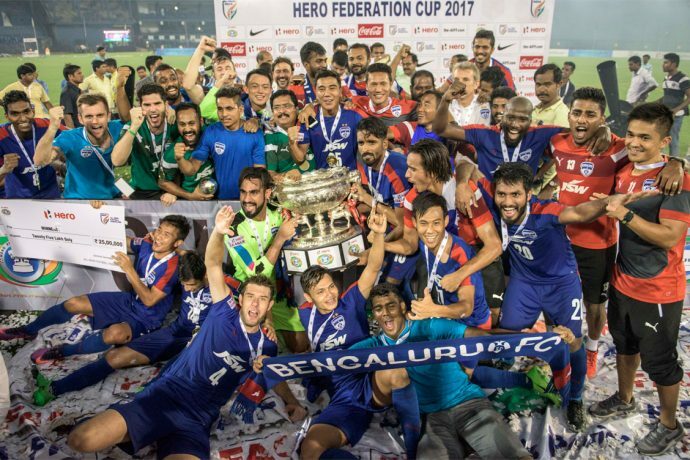 The Blues mocked the odds, dug deep and got the job done to keep their record of winning a major trophy every season intact, while also booking a place in next season’s AFC Cup. After dominating the whole game, it took two strikes from substitute Vineeth to settle the tie. His first, came after the striker took two touches in the box before firing it low and with the help of a deflection, past Debjit Majumder in the Bagan goal. The second, on the counter, saw the striker feint twice before a shot that had too much on it for Debjit to handle as it was parried into the net (118). Roca named a starting XI that had Len Doungel rewarded with a start for consistently strong performances against Bagan in the group stages and the AFC Cup fixture. With no Cameron Watson, Lenny Rodrigues joined Alwyn George and Eugeneson Lyngdoh in the midfield. The Blues’ incessant pressure earned them corners in quick succession and Roca’s side thought they had their lead in the 19th minute when Udanta Singh volleyed home Lyngdoh’s take in stunning fashion only for the assistant referee to disallow the goal after Doungel, in an off-side position, seemed to have got a bit of leg on the ball on its way in. There was a second big chance only two minutes later when Udanta tried to cheekily flick in Lenny’s low cross but Debjit Majumder got enough of a hand to push it out for a corner. In a half that belonged to Bengaluru, Sandesh Jhingan did well to make a goal line clearance from a Katsumi Yusa shot in the 31st minute in what would be Bagan’s only real chance in the first period. While Bengaluru had nothing to complain about Udanta’s disallowed goal in the first half, they were justified in feeling robbed when Juanan Gonzalez’s legitimate prod from close in the 49th minute was wrongly flagged off side. John Johnson headed a free kick from Udanta across the face of the goal and the Blues’ Spanish defender was well on side as he put the ball at the back of the net only for Bengaluru celebrations to be cut short by a flag that should have stayed down. Things soon got frenetic at both ends. Amrinder Singh pulled off a blinder of a save, getting his fingertips on a goal-bound rasping strike from Balwant Singh. Bengaluru soon answered with a counter. Set up by Harmanjot Khabra, Udanta spotted Majumder charging off his line and lobbed to ’keeper only to see the ball bounce wide. But the young winger, who was having a fantastic night, ended up pulling a muscle in the bargain, forcing Roca to bring on CK Vineeth. Bagan then had a flurry of corners in added time of the second half but the Bengaluru defence did enough to see the danger away and take the game to extra time. The Blues’ woeful luck wouldn’t part ways as second-half substitute and former Bagan man Cornell Glen saw his chip from a tight angle bunce off the post with no Bengaluru body to tap home the rebound.